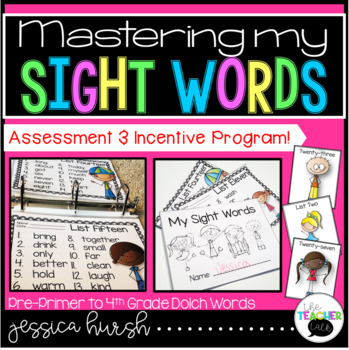 Master My Sight Words - Assessments and Incentives Included! Are you looking to finally organize how you assess sight words while motivating students? This is the perfect product for you! This product includes all pre-primer to 4th grade dolch sight words. 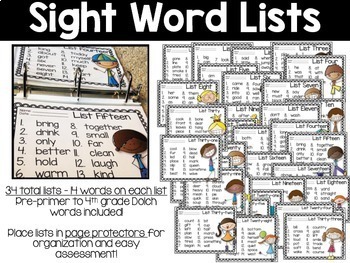 The sight words are separated into 34 different lists with 14 words on each list. The words on each list are large and clear so students are able to clearly read the words. 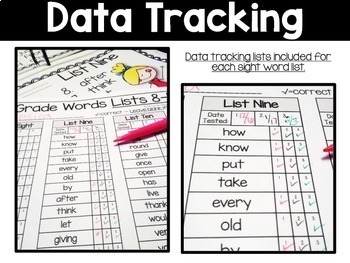 Data tracking pages that correlate perfectly with each list are included with space to write the date and assess knowledge of sight words. Mini-booklets are also provided so you can give students a list of the words that they're working on. 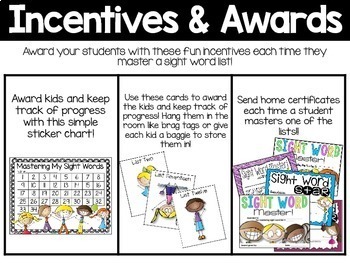 After students master a sight word list then they can earn one of 3 awards (your choice)! I've included a sticker chart with the list numbers. Cards with the list numbers - students can collect these cards in baggie or they can be used like brag tags. Multiple certificates are also provided. Each time students master a list, they can take home a certificate to share their achievement with their families! Take a peek at the preview to see everything included!! If you would like the Word Wall Cards that are organized to perfectly match each sight word list, then click here.